Well Tiger Woods is back for the 2018 golf season! Playing in his first golf tournament in I don't know forever, Tiger Woods played in the 2018 Hero World Challenge in the Bahamas. By all accounts his first tournament back was pretty damn good, finishing a respectful -8 in 9th place. Granted the field is limited to only 18 players for that tournament still, was a better performance then most were expecting out of him. However we’ve seen this scenario before so the question for fantasy golf players, especially for those playing weekly fantasy golf, is “Will Tiger Woods Be Good Fantasy Golf Pick in 2018? Really the only answer is we will have to wait and see but let's break down what to look for with Tiger Woods this year. 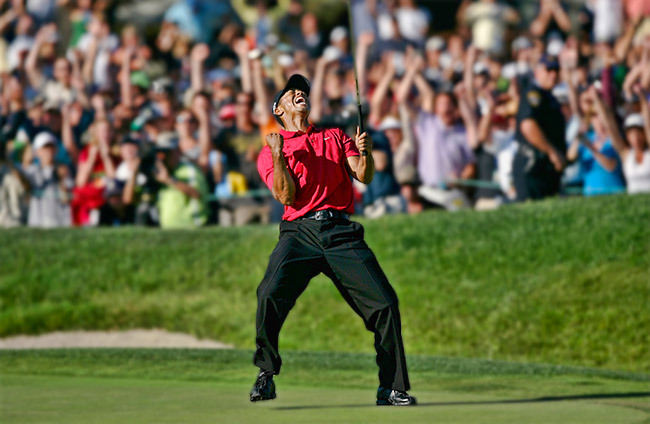 Tiger Woods is healthy today…but how long will that last. Since 2009 Woods has been in and out of hospitals with surgeries to most notably his back along with knees and shoulder. In the past he has come back and had glimpses of the Tiger Woods that use to dominate the PGA Tour of…only to have a new injury pop up again. Tiger is now 42. He should be starting on the downslope of his career although technology in the clubs and golf balls has made many golfers in their twilight years still competitive so his age shouldn’t keep him for being productive again on the tour. However, anyone that has gotten older will know, small strains and injuries happen a lot more as you age so while he shouldn’t be hindered by father time his risk to injuries at every tournament he plays in has gotten a lot higher. If Tiger Woods can stay healthy and based on what we saw from his performance at the Hero World Challenge he could be a sleeper pick for many early tournaments at the beginning of the schedule. If he is to get hurt again I see it coming in the middle of the season to late as opposed to early on. I'm more willing to take a chance drafting him for DFS lineups in any early tournament he decides to play. While most players are going to take a wait and see approach this will be your chance to have an edge on the field with low Tiger ownership. Tiger has never finished worse then 41st at the Masters and that was his 1st time there. When he was healthy it was the lock pick of the year to take Woods at this event. There are guys that would dream of having 8 wins for an entire career. Tiger has won 8 times in the same tournament, including a span of 4 straight years in a row, unreal! Nothing to see here just another 8 win tournament. Has gone back to back twice in his career at Bay Hill. At his most recent comeback in 2017 he did miss the cut at this tournament however before that he had a 4 year in a row win streak from 2005 to 2008. His average overall career finish is 6th place. Tiger has won twice here (not a lot of courses he hasn't won on) but his history is shaky at best. The last time he played in 2015 was a 69th place finish and has only made the Top 25 53% of the time. He has won here 5 times so the potential is always there but his last 2 times playing resulted in a 71st and 65th place finish. He seems to struggle putting in this tournament with an average rank of 30th in the field. Once again Tiger has won 4 times but he has won them all at some point that's why some consider him the GOAT. That being said, the last 5 times playing in this major resulted in 3 cuts, 1 40th place and 1 11th place. For Tiger this is extremely poor course history.